55-3265 of the 1898th Aviation Company, Alaska National Guard. Photo: Unknown photographer © July 1971 - www source. • 55-3265 United States Army. Delivered 12th April 1956. Designated U-1A. 2nd Missile Command at Fort Carson, CO., where it served from Mar 1961 until May 1962..
57th Aviation Company at Fort Sill, OK., from May-1962. Army Aeronautical Depot Maintenance Center (ARADMAC) Depot, Corpus Christi, TX., in Mar-1963 where it was overhauled and then put into storage. 12th Aviation Company, Fort Wainright, Fairbanks, AK, Nov-1964. Alaska National Guard's Headquarters Flight, based at Fort Richardson, Anchorage Jun-1971 as an operational support airlift aircraft. Accident: Unknown location, AK. 21st March 1973. Damage was found on the ski-equipped aircraft after landing. Rivets were popped in the tail area and the tail wheel bulkhead was bent. It was possible that the damage was done while it was taxying in deep snow, when the tail wheel struck an object buried in the snow. The damage must have been substantial, as the aircraft was deleted from the Army inventory in June 1973.
following month, based at Fort Wainright. 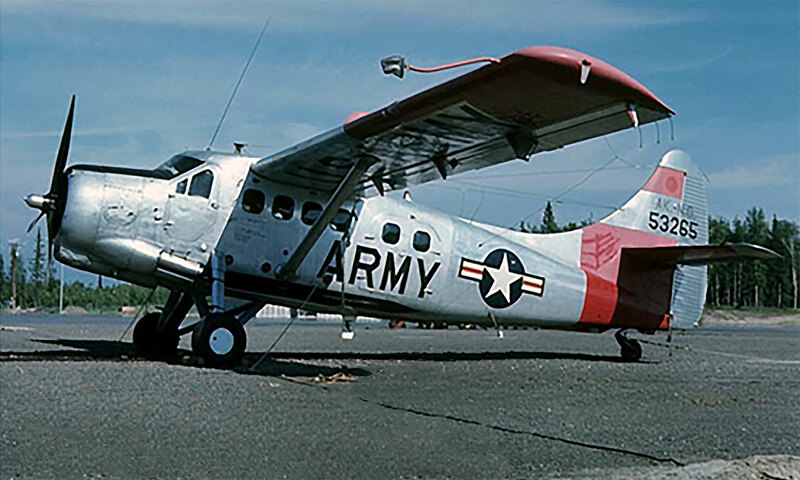 It was to serve with the 12th for six and half years, until June 1971 when it was transferred to the Alaska National Guard's Headquarters Flight, based at Fort Richardson, Anchorage as an operational support airlift aircraft. 53265 was still serving with the Alaska National Guard when it suffered damage on 21st March 1973. According to the incident report, damage was found to the ski-equipped Otter after landing. Rivets were popped in the tail area and the tail wheel bulkhead was bent. It was possible that the damage was done while the Otter was taxying in deep snow, when the tail wheel struck an object buried in the snow. The damage must have been substantial, as the Otter was deleted from the Army inventory in June 1973 as “broken up for spare parts”.